Russia is ready to build a gas pipeline in Pakistan that will ensure gas supplies from Iran to that country. Some analysts view this as Moscow vying to compete for the Pakistani market, which China is vigorously moving to occupy, while others warn that the project could ultimately harm Russian interests. A subsidiary of the Russian state corporation Rostech has offered to build a pipeline that will carry gas from Iran to cities in Pakistan. The project is estimated to cost $2.5 billion dollars. 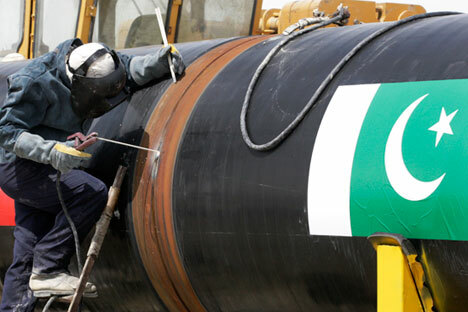 The pipeline will extend almost 1100 kms from Karachi, in southern Pakistan, to Lahore in the north-east. This is the first major project in Pakistan in 40 years in which Russians are involved. The project envisages the construction of five compressor stations. As planned, the project should be ready for the gas pipeline to enter into operation in 2017. During construction, “technology, materials, equipment and products of Russian manufacture” must be used “as much as possible”. Additionally, it is expected that Russian research, design and construction organizations will be involved. Pakistan, for its part, guarantees the right to use the land along the defined pipe laying route, including for research and other works. Moscow and Islamabad must now sign an agreement at the ministerial level within a month’s time. Rostech’s partner in the project will be Inter State Gas Systems (ISGS) controlled by Pakistan. Rostech will attract debt financing, and the state corporation says they are considering Russian as well as foreign (including Pakistani) investors for this. But Rostech has been under sanctions since 2014. So attracting loans from Western banks is practically excluded as a possibility. “Taking into account the political importance of the project, these could be quasi-public funds, for example, from the VEB,” writes Kommersant, providing a link to a source in the government. Will Russia be able to compete with China? The energy deficit in Pakistan has become a major economic problem, in addition to a political one over recent years. The population endures constant rolling blackouts, notes chief researcher at the RAS Institute of Oriental Studies, Vladimir Moskalenko. “The development of relations with Pakistan lagged behind for a long time because of Russia’s traditional orientation towards India, and now Moscow must make haste not to lose the Pakistani market to China, which is becoming Islamabad’s main economic partner,” said Moskalenko. China and Pakistan preliminarily agreed to construct a gas pipeline from Iran to Pakistan in April this year; called the “Peace Pipeline”. Tehran claims the Iranian segment, around 900 kms long, is already built. Islamabad conducted secret talks with China for many months about the construction of its segment of the pipeline, for which US $2 billion is required. Kommersant’s interlocutor in the government agreed that it was important for Russia to strengthen its position in Pakistan, including in the area of gas transport, from a geopolitical standpoint, since the country could become a major gas transit route to India in the future. But constructing pipelines in Pakistan could also have a negative effect for Russia,” writes Gazeta.ru. The publication quotes RusEnergy partner Mikhail Krutikhin, who said that “Iran will now conduct negotiations with Pakistan and China, and, essentially, the gas pipeline that Russia builds will become part of a future gas highway from Iran to China. Participating in the Pakistan project is quite disadvantageous to Russia: supplies from Iran will lower Chinese demand for gas, including from Russia,” warned Krutikhin.